Just a quick note to say how pleased and thankful we are to have met you. The work you completed has really made our home heating system so much better. Your team was professional and left the house clean. The before and after graphics showing the increased efficiency was impressive, I can't believe we were wasting that much energy and throwing our money away! The temperature is even throughout the house and though we are in one of the coldest winters in my memory, our system is not working as hard as it used to. In addition to our house being much more comfortable, Wah Gas just lowered our budget payments by 75%, so replacing the insulation is really paying off. They came last month and did an energy audit and made recommendations - some of which we did ourselves. They vacuumed out our attic of all old insulation and sprayed in new insulation/added reflectix and the house is much more comfortable. Just a quick word about Mike Shepard and Armando. Their work was very professional and very well done. I didn't have a chance to meet them but Linda did and was happy with the way they did the work and cleaned up afterwards. I did go through the crawl space and it was done extremely well. Please pass our "thanks" to Mike and Armando for doing such a great job. Thanks again for the audit and doing the crawl space and cantilever. We can already tell the difference. I enjoyed meeting you at the Spring 2009 Home and Garden Expo and discussing the great work you and your company are doing. I met your staff at the fall 2008 Home Remodeling Show and decided to have a home energy audit done at the recommendation of two of my neighbors who had just it completed on their townhomes. They had told me how thorough the audit was, what the recommendations were and how the staff worked with the homeowner to make the cost-efficient changes needed. My audit and subsequent work was completed in November 2008. I would sincerely like to commend Joe, Mike and Armondo for the diligence, patience, and care they exhibited during the whole project. Joe conducted a very thorough audit and explained every detail about what he was doing, how and why, and what recommendations he had for making corrections. He also offered advice on how to make some of the simple corrections myself in order to save money. Once the work was scheduled, Mike and Armondo arrived on time and worked quietly, quickly and efficiently to seal the attic and put up the reflectix material. The project only took two days to complete. Because I had to work on the second day, I had to leave Mike and Armondo at the house by themselves to complete the work. When I came home, not only had they completed the work, they had patched two old nail pops in the ceiling and left the work area and parts of the house they traversed and were working in spotlessly clean. I received a call from Joe the next day to make sure that everything was in order and to ensure that the work was top quality. Needless to say, I am very happy with the results! 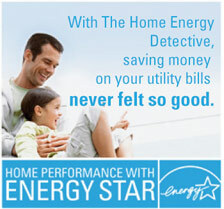 I look forward to maintaining my energy-efficient home and reducing my energy costs. If I can be of any service to you in the future as a reference, please let me know. Thank you.